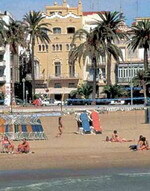 Salou - a seaside resort and tourist center, about 10 km from Tarragona on the Costa Dorada, Spain. Aside from its string of beaches interrupted by rocky coves, and its landscaped promenade, one of its main attractions is the Port Aventura complex, a large theme park. 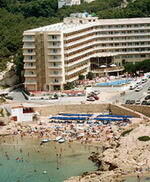 The Augustus Hotel is a seafront resort property situated directly on the beach overlooking the promenade in the resort of Salou on the Costa Dorada. 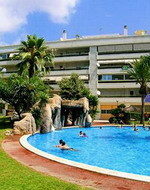 It is five kilometres from Cambrils and 10 kilometres from Port Aventura. Amenities at this family-friendly hotel include a swimming pool for adults, with a separate pool for children and a sun terrace. Drinks are available from the poolside bar, and kids can be kept amused at the kids' club. There is also an entertainment programme, musical shows, dances and folklore evenings, and a TV room with a large satellite television and video screenings. The Augustus Hotel has a modern restaurant serving buffet-style Mediterranean and international dishes for breakfast, lunch and dinner. Children can enjoy the playground, and other activities include billiards and video games. Augustus Hotel offers 340 air-conditioned guestrooms, located on five floors, which have simple, modern decor with tiled floors and wooden furnishings. The Hotel Cala Font is housed in an eight-storey tower block overlooking a bay with a sandy beach, and is located three kilometres from the centre of the resort town of Salou. 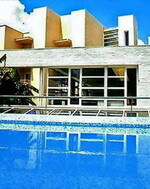 The hotel offers an outdoor pool with a bar, as well as a dedicated children's pool. Guests can unwind in the jetted tub. A kids' club and a children's playground will keep younger guests entertained. In the evenings, guests can unwind over drinks in the hotel bar or play pool in the games room. Diners can head for the Cala Font restaurant, which serves a buffet of international dishes and Spanish specialities. Those arriving by car will find garage-parking facilities on site. The Port Aventura theme park is six kilometres from the hotel, and the Modern Art Museum is ten kilometres away. The 312 guestrooms feature light decor, brightly patterned fabrics and sliding glass doors leading to balconies. The Jaime I Hotel is located on the Costa Dorada, in the resort town of Salou, Spain, 300 metres from the centre of Salou and 500 metres from the beach. The hotel is 2.5 kilometres from the Port Aventura theme park, and the ancient town of Tarragona is approximately 15 kilometres to the north. With a restaurant, shops, a hair salon and five bars, including one by the pool, the Jaime I Hotel is a self-contained modern resort. Facilities include indoor and outdoor swimming pools, and a health club with a gym, squash court, sauna, spa tub and Turkish bath. A splash pool and playground are provided for children, and the kids' club offers supervised activities. A buffet-style complimentary breakfast is served each morning, with lunch and dinner buffets available later in the day. The beach, 500 metres away, offers opportunities for boat hire, scuba diving and snorkelling. Activities available in the local area include golf, tennis and horseback riding. Set amid lush greenery, the Jardines Paraisol is a modern property located within 500 metres of the beach and Salou town centre, and ten kilometres from Reus. Guests can enjoy a stroll through the hotel gardens and go for a cooling dip in the hotel's outdoor pool, which comes complete with a waterfall and slides. The hotel also offers a play area for children. Further practical amenities include a multilingual staff on hand to exchange currency and offer tour assistance. Sun worshippers can pend a day at the beach, next to the hotel. Those with children can head to the Port Aventura fun park, two kilometres away, which offers roller-coasters, rides and live entertainment. The 59 modern apartments are decorated in light colours with patterned fabrics and painted wood furnishings and open onto balconies. 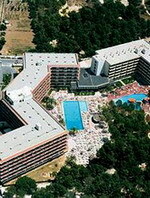 The Sol Costa Daurada is a modern resort situated in Salou on the Costa Dorada, 900 metres from a beach and one kilometre from Port Aventura theme park. The hotel is close to many of the areas main attractions; five kilometres away is the Aquopolis aqua park, while Tarragona and its Roman ruins, shops and restaurants, is 15 kilometres distant. The hotel's Restaurante Mediterraneo offers Mediterranean buffet cuisine served in a cool ambience with modern furnishings. Guests can swim in the indoor and outdoor pools, and there is a separate children's pool, all within gardens, with ample terraces for sunbathing and a poolside bar serving snacks. The spa centre is the place to unwind, featuring an indoor pool, gymnasium, jetted tub, sauna, Turkish Bath, solarium and a massage treatment room, while the Miniclub can keep kids out of trouble with a range of activities. Sitges - 30km south of Barcelona, is definitely the highlight of the Costa Daurada - the great weekend escape for young Barcelonans, who have created a resort very much in their own image. It's also a noted gay holiday destination, with a nightlife to match; indeed, if you don't like vigorous action of all kinds, you'd be wise to avoid Sitges in the summer: staid it isn't. As well as a certain style, the Barcelona trippers have brought with them the high prices from the Catalan capital, while finding anywhere to stay (at any price) can be a problem in summer unless you book well in advance. The Antemare Hotel is a modern hotel situated in a residential area of Sitges, 50 metres from the beach and 30 kilometres from Barcelona city centre. Several museums and galleries are within one kilometre of the hotel and La Geltru castle is six kilometres away. The hotel's Thalassotherapy centre offers a range of health and beauty treatments; guests can relax in the seawater multi jet bath, enjoy a session in the sauna or steam room, or have a therapeutic massage. Guests can also take a dip in the outdoor pool with its separate children's area or relax on the sun deck. Parents will appreciate the babysitting service. The hotel's restaurant, open for breakfast, lunch and dinner, offers al fresco dining in the summer months and serves seasonal Mediterranean specialities. Before or after a meal, guests can relax with a drink in the bar. 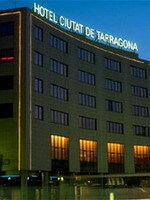 The modern Dolce Sitges spa hotel and conference centre is located in Sitges, Spain. It is within two-and-a-half kilometres of the beaches and town centre of Sitges. The city of Barcelona is 35 kilometres from the hotel. 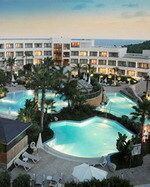 Dolce Sitges is a large white hotel overlooking the Mediterranean. The lobby has seating areas and a wall of windows looking out towards the sea. The relaxed Verema restaurant is a buffet-style dining room serving a wide selection of dishes. Esmarris is an a la carte restaurant with a menu of Mediterranean specialities. There are two bars, the poolside Cala Morisca, and informal indoor Malvasia, offer snacks and drinks. The hotel has a choice of four outdoor pools, including one for children, and another pool indoors at the fitness centre and spa. Hot tub, sauna, steam bath, gym with aerobic classes, and beauty and therapeutic treatments from massage to manicures are available in the spa. The Hotel Celimar is a modernist 19th-century property set right on the seafront in Sitges, 25 metres from the beach and 36 kilometres from Barcelona city centre. The hotel's location right on the beach promenade provides guests with plenty of opportunities for enjoying water sports and sea swimming, as well as strolling along the seafront. After enjoying a buffet breakfast, guests can relax with a coffee on the hotel's outdoor terrace and take in views of the sea. Wireless Internet access is available throughout the property for those who want to plan sightseeing itineraries or keep in touch with friends and family. Staff at the 24-hour front desk can look after valuable items in the safe-deposit box and provide room service (limited hours). Parking can be arranged nearby, and an express check-in/out service is available. Hotel San Sebastian Playa is a white seafront hotel overlooking San Sebastian beach by Sitges old town, 500 metres from the lively main promenade and town centre. Built in 1991, it has Moorish style design with large archways and curved balconies. Guests can spend lazy days by the pool on sun loungers under parasols, enjoying beach and sea views from the tropical garden terrace, unwind with a drink from the bar, and relax in the lounge area with its eye-catching Modernista staircase. Overlooking the pool and tropical garden with sea views, the restaurant serves fine Catalonian seafood specialities such as Rice Soup with Lobster. The vibrant resort of Sitges offers four kilometres of sandy beaches as well as many fashionable boutiques, bars and restaurants, and plays host to numerous festivals throughout the year, the most famous being Carnival in February. The Melia Sitges is a deluxe hotel situated 20 kilometers from El Prat Airport and 20 minutes from the city center of Barcelona. This hotel is convenient to cultural and sporting attractions as well as some of the finest golf courses in the area. Sitges is a charismatic and cosmopolitan coastal resort in Catalonia, overlooking the Aiguadolç Marina. At the Melia Sitges, guests are not far from the shimmering sandy beaches and the thrilling water sports. The hotel's proximity to Barcelona puts the guest close to the business and excitement of a big city and yet far enough from the hustle of the city to enjoy restful relaxation at the end of the day. For fitness or fun, work out in the fitness center, relax by the heated swimming pool or spoil yourself with a hydro-massage. The Melia Sitges is convenient to dining, shopping and entertainment venues. Breakfast is not included during the week and from Friday to Sunday breakfast is complimentary. Majestically sited on a rocky hill, sheer above the sea, TARRAGONA is an ancient place. Settled originally by Iberians and then Carthaginians, it was later used as the base for the Roman conquest of the peninsula, which began in 218 BC with Scipio's march south against Hannibal. The fortified city became an imperial resort and, under Augustus, Tarraco became capital of Rome's eastern Iberian province - the most elegant and cultured city of Roman Spain, boasting at its peak a quarter of a million inhabitants.. 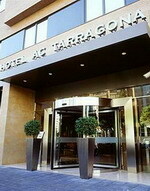 The AC Tarragona is a modern eight-storey hotel located in historic Tarragona, 500 metres from the main train station and one kilometre from the cathedral. Guests can relax on the terrace in warm weather and work out using the hotel's modern fitness equipment. Business guests have the use of fully-equipped conference facilities and there is wireless Internet access throughout the hotel; those guests arriving by car will appreciate garage parking. The hotel restaurant, with its minimalist-style decor, serves modern Spanish and Mediterranean dishes and a wide range of fine local wines and is open for breakfast, lunch, and dinner. The 115 air-conditioned guestrooms have crisp white bedding, parquet flooring and modern cream decor. All include minibars, satellite television, telephones, wireless Internet, and complimentary newspapers. 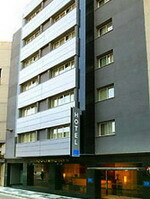 The modern silver-fronted Hotel Ciutat de Tarragona overlooks the central Imperio Tarraco Square, four blocks away from the ruins of Roman Tarragona. Directly in front of the hotel are the tree-lined promenades of the Imperial Tarraco Square. For a family day out, the fun-packed Port Aventura theme park is a 10 kilometer drive away. Guests can work out in the on site fitness center, go for a revitalising dip in the pool, relax in the sauna or enjoy tapas, aperitifs and Mediterranean cuisine in one of the hotel's two restaurants. Other amenities include a business center, banquet facilities and 24-hour front desk. The 168 soundproofed guestrooms have designer furniture and polished parquet floors. Guestroom amenities include Internet connections and newspapers. Bathrooms have designer toiletries, bathroom telephones and hand-held showers. 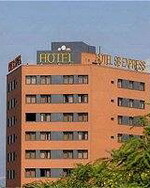 The SB Express Tarragona is a modern hotel located right in the centre of the old Roman HQ of Tarragona and about 900m from the World Heritage Site of Roman Tarraco. This comfortable, contemporary hotel is only another 8km from the Port Aventura theme park. For the stressed parent there is a babysitting service to allow for a few hours of peace and quiet in the cafeteria or for a night out enjoying the delights of the Tarragonian nightlife. The 24 hour multi-lingual front desk staff can organise bike and car rental as well as advice on the best golf courses and beaches in the area. In the cafeteria one finds a wide range of breakfasts, meals, salads and warm and cold sandwiches. The opening hours are from 7 to 11 pm which is complemented at night with a vending service. Small pets are welcomed into the hotel at a small extra charge. Tortosa - the capital of the comarca of Baix Ebre, in the province of Tarragona, in Catalonia, Spain, located at 12 metres above the sea, by the Ebre river. It was conquered from the Moors by the Count Ramon Berenguer IV of Barcelona in 1148. Visit the Ebro Delta Natural Park, the Benifallet Caves and Miravet Castle. The Berenguer IV is a modern hotel located in the centre of Tortosa in the Tarragona Region of Spain, 10 kilometres from the Delta de l'Ebre nature reserve. The city centre offers a number of attractions within 300 metres including the Gothic cathedral and Municipal Park. The historic Jewish district, Remolins, is a one kilometre walk. The national park and nature reserve of the Delta de l'Ebre is 10 kilometres away as is the region's mountainous area. After breakfast guests can browse through complimentary newspapers in the lobby while enjoying a coffee from the café. Business guests benefit from three meeting and convention rooms accommodating functions from lectures to cocktail parties. The multilingual concierge is on hand 24 hours a day to help guests make the most of their stay in the city. Pay parking is available 200 metres away. In the centre of the fertile Ebro valley and sheltered by the Beceite mountains, which provide a stunning view from the pool and balconies, the Hotel stands in the higher part of this town which adds its own beauty to the attractions of the different types of natural settings around it. 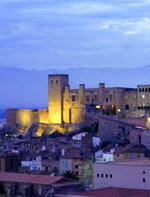 Abderramán III decided to build the fortress which now houses La Zuda (well), and four splendid Catalan Gothic windows. The interior decor of the hotel reflects a predominantly Christian, baronial style, with traditional furniture and wooden beams. Within the arabesque-decorated walls the dining room stands out with its Gothic windows. Sit by one of the Gothic windows in the Parador’s dining room and enjoy its rice dishes, its anguila en suc, its suquet de peix (fish stew) or the local pastries, pastissets and garrofetas. Vilaseca - The coastline of Vilaseca, like the majority of the Costa Daurada, has undergone considerable changes to its landscape, mainly due to the 'tourist boom' of recent decades. Its beach area is now largely built-up and has a considerable number of facilities and services. Nevertheless, aware of the valuable asset it has in its beaches and coastal ecosystems, the town council has embarked on an ambitious project to protect and restore the landscape and ecology of the whole of its coastline. 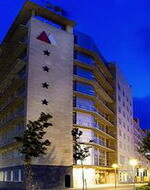 The Aparthotel Atenea Aventura features a coastal location in southeastern Spain. Located in the center of the town of Vila Seca, the hotel is just 500 meters from one of the largest amusement parks in Europe, Universal Port Aventura and 3 kilometers from the beach. The Aparthotel Atenea Aventura offers an array of amenities for leisure travelers. The hotel boasts an outdoor pool, a spa and sauna and a small fitness facility. At the Restaurant Atenea Aventura, regional fare places an emphasis on local and seasonal ingredients. Each morning, a complimentary breakfast buffet is available. Other property amenities include a poolside bar and a bar/lounge. Wireless Internet access is complimentary. The property comes with 94 sound-insulated rooms featuring ensuite bathroom with bathtub and hairdryer. All of the accommodations come furthermore equipped with idividually controlled air conditioning, direct dial telephone, desk, electronic safe, free Wi-Fi Internet connection, mini fridge, satellite TV and heating. Some of the rooms feature a kitchen.